those in our Diocese whom you are calling to the priesthood to courageously follow Your will. Send laborers into Your great harvest so that the Gospel is preached, the poor are served with love, the suffering are comforted, and your people are strengthened by the sacraments. We ask this through Christ our Lord. In addition to the above prayer, the Queen of Vocations devotion will be said in school classrooms. Posters for every classroom in the Diocese (elementary and high school) as well as a bookmark for every student in the Diocese are being provided to the schools at no cost to them. The Melchizedek Project will be implemented in each high school in the diocese encouraging discernment to the priesthood. It is centered around a discernment group that meets ideally seven times throughout the course of the academic year. 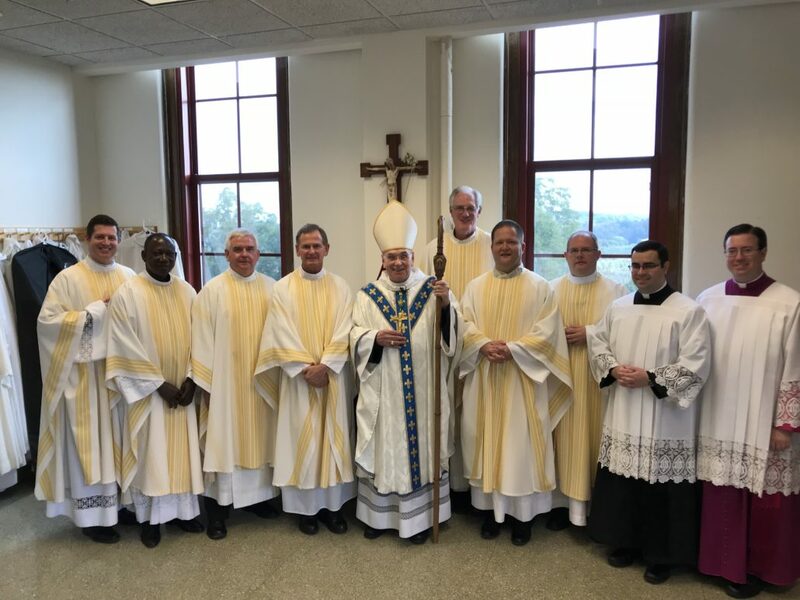 The idea is to form a group of men who are serious about their faith and then together try to discern which vocation God is calling each of the men to embrace. Each member receives a copy of “To Save A Thousand Souls” by Father Brett Brannen. The group reads and discusses sections of the book following a set discussion guide. The groups are encouraged to pair the meetings with a meal or some other activity. Bishop Roger Foys will preside at opening Vespers for the Year of Prayer for Priestly Vocations Sunday, November 26 at the Cathedral, at 3:00 p.m. The Sacrament of Reconciliation will be available immediately following 10 a.m. Mass and through closing Benediction. A kick-off Discernment Event will follow Vespers. Throughout the Year of Prayer for Priestly Vocations there will be Vocations Days at all high schools in the diocese, Deanery Discernment Events, and Monthly Discernment Dinners organized by the Diocese of Covington. Dates and location are listed below. All are encouraged to actively participate in events and in prayer. 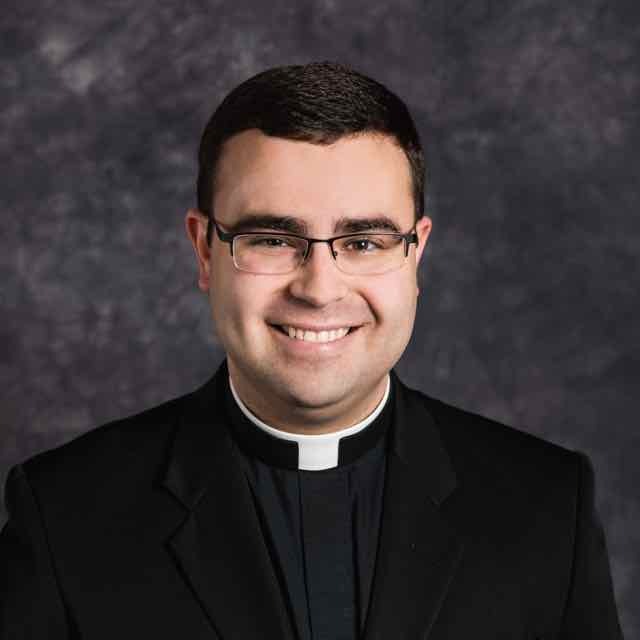 Year of Prayer for Priestly Vocations begins, November 26 with Opening Vespers at the Cathedral, at 3:00 p.m. The Sacrament of Reconciliation will be available immediately following 10 a.m. Mass and through the end of Vespers. A kick-off Discernment Event will follow Vespers. December 3, 2017: Monthly Discernment Dinner – Cathedral – 6:30 p.m.
January 7, 2018: Monthly Discernment Dinner – Cathedral – 6:30 p.m.
February 4, 2018: Monthly Discernment Dinner – Cathedral – 6:30 p.m.
February 15, 2018: Northern Kenton Co. Deanery Discernment Event. Location: St. Agnes, Ft. Wright – 5:30-8:00 p.m.
March 4, 2018: Monthly Discernment Dinner – Cathedral – 6:30 p.m. 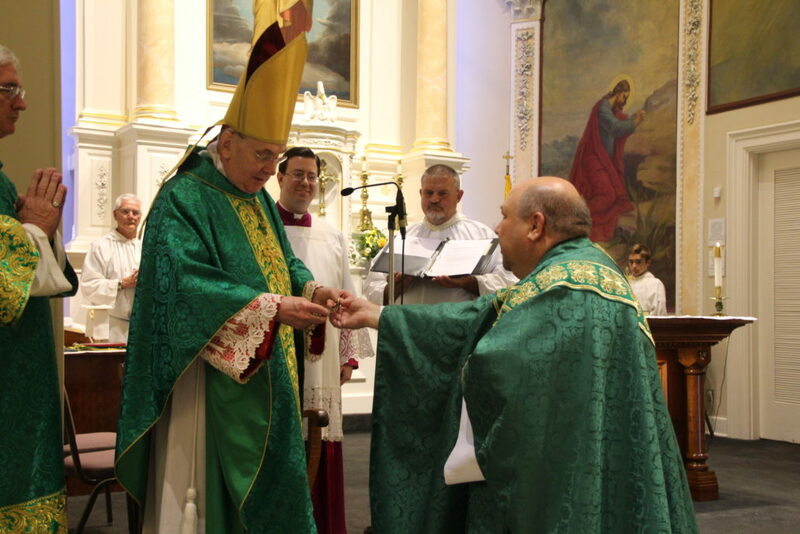 Location: St. Joseph, Cold Spring – 5:30-8:00 p.m.
April 8, 2018: Monthly Discernment Dinner – Cathedral – 6:30 p.m.
May 6, 2018: Monthly Discernment Dinner – Cathedral – 6:30 p.m.
June 3, 2018: Monthly Discernment Dinner – Cathedral – 6:30 p.m.
June 4, 2018: South East Deanery Discernment Event Location: St. Patrick, Maysville – 5:30-8:00 p.m.
July 1, 2018: Monthly Discernment Dinner – Cathedral – 6:30 p.m.
August 5, 2018: Monthly Discernment Dinner – Cathedral – 6:30 p.m. Location All Saints, Walton – 5:30-8:00 p.m.
September 2, 2018: Monthly Discernment Dinner – Cathedral – 6:30 p.m.
October 14, 2018: Monthly Discernment Dinner – Cathedral – 6:30 p.m.
November 4, 2018: Monthly Discernment Dinner – Cathedral – 6:30 p.m.
November 25, 2018: Closing Vespers – Cathedral – 3:00 p.m. The Logo and other promotional materials designed by Seminarian Jordan Hainsey. The two great symbols that embody the Priesthood are Eucharist and Confession. Accompanying the violet stole is a monstrance. The monstrance is the same one from the Duveneck painting featuring Bishop Maes who is shown holding it in blessing in the great mural in Blessed Sacrament Chapel at the Cathedral Basilica of the Assumption. The rays of light are symbolic of the Holy Spirit who invites young men to come, discern, and share in Christ’s Ministerial Priesthood. The shape of the stole is a loose “M” for Mary, mother of priests. 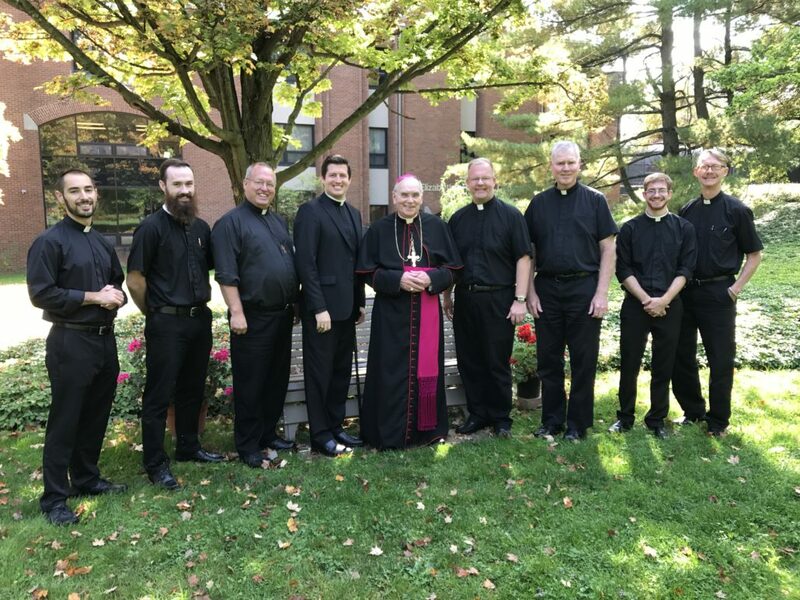 On the first Sunday of every month the Cathedral Basilica of the Assumption, Covington, will host a Discernment Dinner at the Cathedral rectory for men (high school age and older) who are discerning a vocation to the priesthood, open to the possibility of a vocation or simply like to have questions answered about the priesthood or seminary. Dinners begin at 6:30 p.m. and usually last one to one and a half hours.